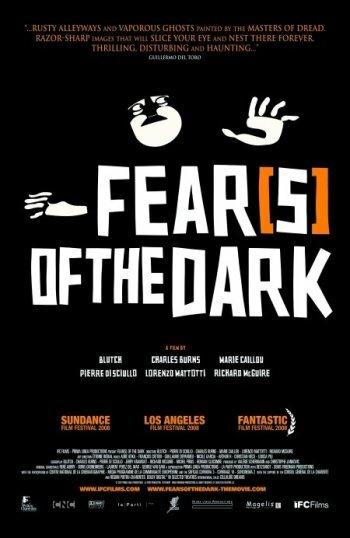 That’s how Scott Weinberg describes Fear(s) of the Dark over at Cinematical. Seems quite intriguing. The poster, on the other hand, is kind of dull. It does look like a poster for a french animated horror anthology in black and white, but it’s the most boring non-remarkable version of a poster for that film. Way too much space used for the title, not enough showcasing the (supposedly) compelling imagery of the flick or the general premise. This is a recurrent complaint of mine. Safe mainstream posters for film that are weird, different and that have very little chance of actually being interesting for a broader audience. Why not go out on a limb more? Of course, sometimes we also get posters that try too hard to make the film seem different and special when something a little more polished and mainstream could have been just perfect. But nobody ever said this poster business was easy. I wonder what’s up with the half-laurel for the festivals. Probably just a glitch with an EPS or something, but I’m surprised no one caught it before circulating the poster. If it’s done on purpose, that’s just weird.